Germany’s Bauhaus art school, which was founded in 1919 by German architect Walter Gropius, and ran until 1932, was something of a prototype for the art school as we know it today, where parties and a collective mentality give rise to collaborative work and self discovery. Although visual signposts such as stark geometric shapes, simplicity and elegance of design might be the easiest-to-spot indicators to Bauhaus’s effect on contemporary fashion, fittingly, for a movement defined by its core principles, it’s the school’s ethos that has proven to have the most enduring influence. Here, AnOther traces the intellectual ideas that shaped Bauhaus as they have resurfaced in fashion. “Freedom from ornament is a sign of spiritual strength,” wrote Austrian Architect Aldof Loos, and although pre-dating Bauhaus, his philosophy underpinned the school's approach. His sentiment is echoed by minimalist pioneer Jil Sander, who said “I think there is always a need for pure design. With pure design, you don’t need so much decoration.” Sander too, who debuted her eponymous collection in 1973, rose to fame with palate-cleansing simplicity, which tempered the frivolity of the 70s and excesses of 80s fashion, just as Bauhaus’s simple approach came as a reaction against the fallible and frivolously decorative human touch of the arts and crafts movement that preceded it. Despite the almost mechanical precision of Bauhaus, the work itself did not lack heart. Artists like painter Paul Klee and designer Marcel Breuer’s work was infused with colour and playfulness. “He who wishes to become a master of colour must see, feel, and experience each individual colour in its endless combinations with all other colours,” said Bauhaus scholar Johannes Itten. It’s no surprise that the clean-lined, primary coloured aesthetic of Bauhaus resonated with Phoebe Philo, the poster woman of luxe, fuss-free fashion, who worked geometric metal into accessories and applied typically Bauhaus primary block colours to already iconic Céline leather pieces in the house’s S/S14 collection. “I’m very interested in how clothes make us feel,” she affirmed. From professional collaborations between Roy Halston Frowick and Andy Warhol in the 70s, which were born out of socialising and played out across one another’s work, to the club nights and warehouse parties which continue to take place in cities around the world, fashion’s love of partying has generated unexpected intersections between designers and other creatives. 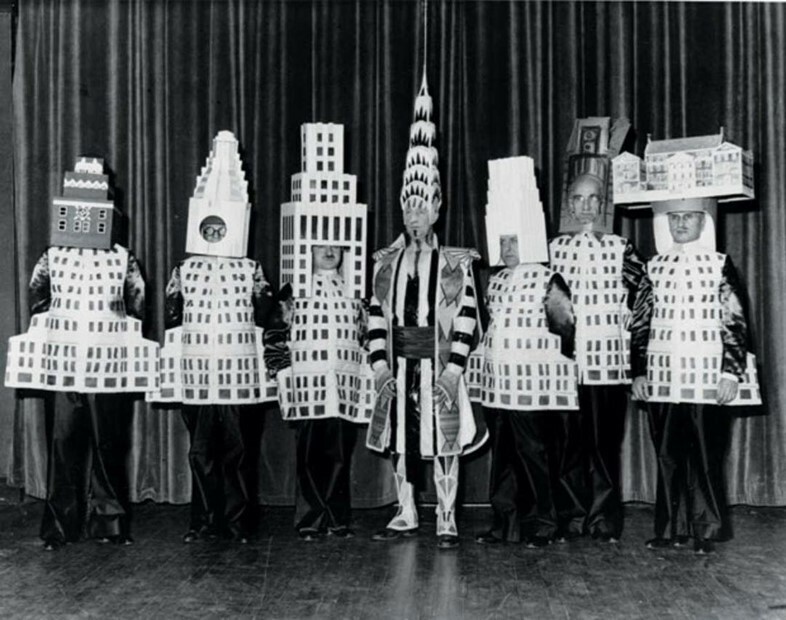 Parties were key to the structure of the Bauhaus school, too, providing students with space to network and spark collaborations as well as a platform on which to let their creativity run rampant. “The themes ranged from the Beard, Nose and Heart party to the White party – in which revellers were asked to dress in ‘two thirds white, one third spotted, checked or striped’. The Metal party took it even further: costumes consisted of tin foil, frying pans and spoons, and the party was entered by sliding down a chute into a room decorated with silver balls and the sound of bells,” wrote Fashion Historian Amber Burchart. Walter Gropius’ Bauhaus school acted as a prototype model for the art school we know today. A common philosophy underpinned an art collective mentality. “It is a fundamental requirement of all artistic creativity that every student undergoes a thorough training in the workshops of all branches of the crafts,” he said. From Acne to Vetements and Études studio, to the rise of the concept store, the idea that fashion should stick to clothes alone is now out-dated, with multi-discipline collectives producing everything from home accessories to books and zines. The final Alexander McQueen fashion show to take place before the designer’s death was the blockbuster Plato’s Atlantis S/S10 collection. Its significance within fashion history has not only marked it out as pioneering in terms of its use of technology – showing a fashion film by Nick Knight, who also streamed the show live on SHOWStudio, which subsequently crashed due to a unpredictably vast volume of traffic – but beyond the hype, the aesthetic of the collection was equally astounding. These were not models presenting clothes, but, having had their silhouettes warped with McQueen’s vertiginous armadillo shoes and their heads mutated with reptilian scales, they became monsters; their human characteristics sacrificed to fully realise McQueen’s vision. 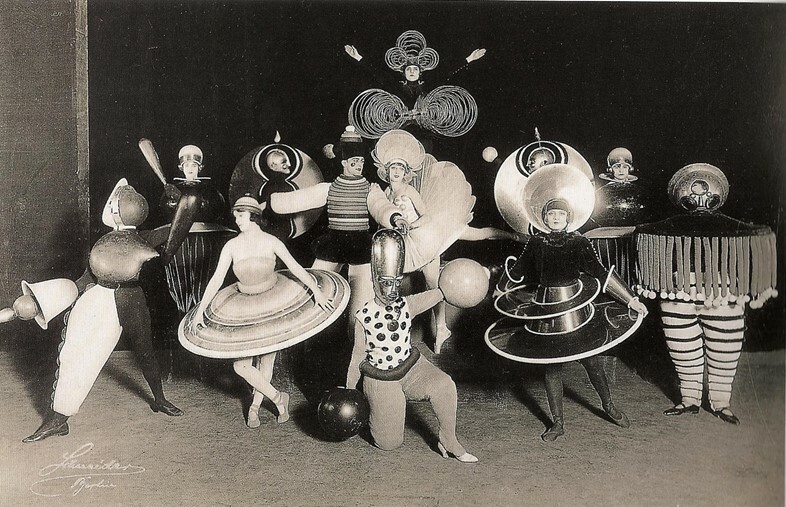 In the 1970s designers in the Bauhaus movement used clothing and costumes that suppressed the human element in order to realise some higher creative concept. 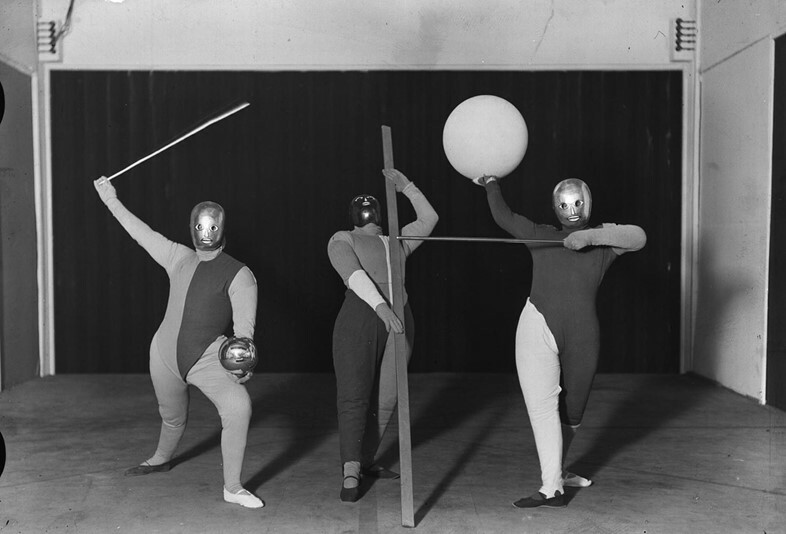 In German artist Oskar Schlemmer’s Triadisches Ballett (1922) dancers are dressed in three-dimensional perfect geometric forms, with metal masks with black eyes and bulbous primary red and blue spheres for arms. 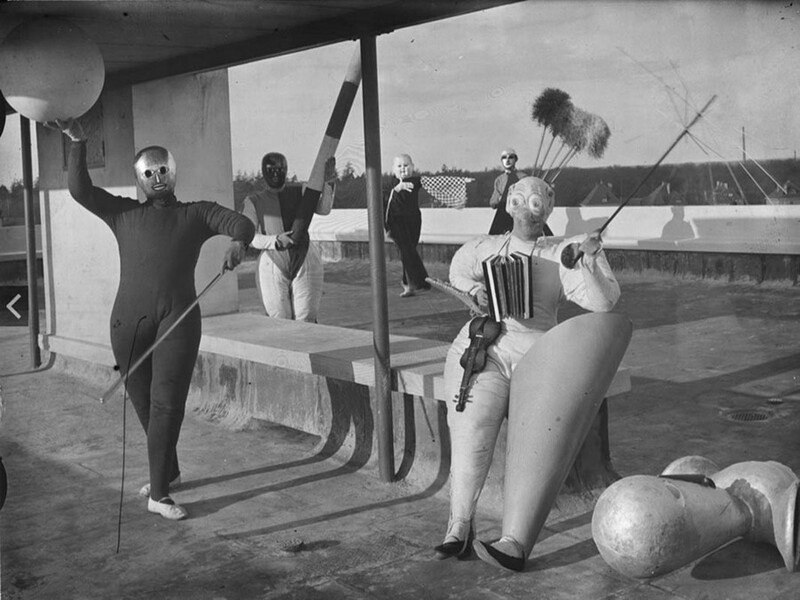 Just as McQueen’s transformative Armadillo shoes created a tribe of slow-marching, gangly space monsters, Schlemmer’s too influenced the performers' movements; the choreography had the cast of demented, pastel-hued robots stepping metronome-like in time to a score of mechanically even tempo.